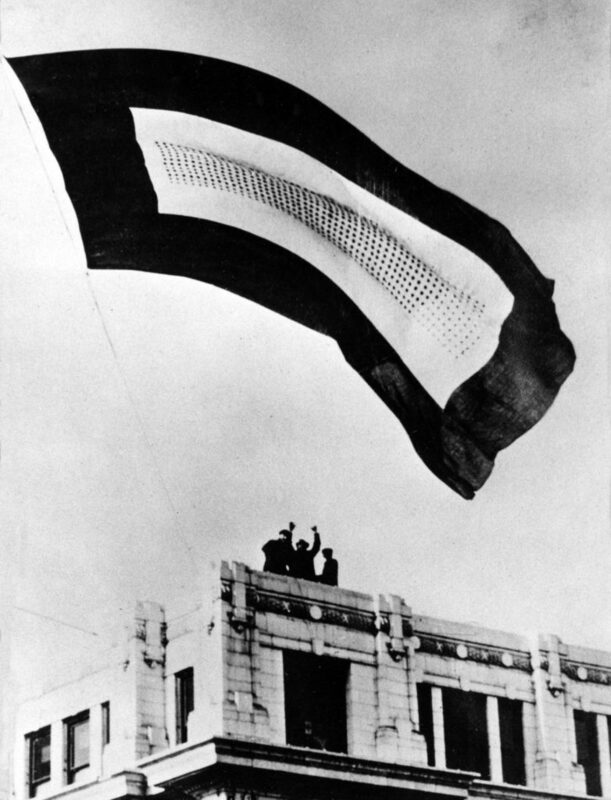 After several cancellations due to inclement weather, Richmond finally unfurled its Community Service Flag on February 4, 1918. The ceremony was part of a day-long war conference staged by the Wayne County Council of Defense. The Coliseum was the venue for most of the day’s speeches and rallies, but around noon participants walked the block and a half to the corner of Eighth and Main Streets to witness the unfurling of the flag. The Item reported that approximately 2,500 people listened to a couple patriotic speeches before Mrs. A. W. Roach, who was the chair(wo)man of the War Mothers of Wayne County was introduced. She said that even though she had two sons in the army, she was not qualified to perform the duty of presenting the flag. That honor belonged to Mrs. Frank Gausepohl, who had three sons in the service. Moments later, she pressed a button that electrically let loose the flag from a flag pole on top of the Second National Bank building, seen here. On this date the service flag had 600 stars, but by September 1918 it contained 2,400 stars.